Hardcover, $35.00 plus $5.00 shipping. 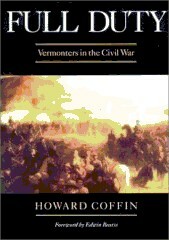 Ken Burns says, “Full Duty is that rare Civil War gem: a story that makes that remarkable and tragic war come alive and seem more human.” Coffin’s Full Duty is the first history of Vermont in the Civil War to be published since the 1880s. Forward by the eminent historian Edwin Bearss, former chief historian of the National Park Service. James McPherson says, “The Second Vermont Brigade’s moment of glory at Gettysburg came at the most decisive turning point of the Civil War…Skillfully weaving together the letters, diaries, and memoirs of these men from the farms and villages of Vermont, Howard Coffin’s splendid narrative carries the reader eagerly forward to their rendezvous at Gettysburg.” Nine Months to Gettysburg is the story of the nine months soldiers from Vermont who broke the flank of Pickett’s Charge. Forward by Edwin Bearss. Hardcover, $30.00 plus $5.00 shipping. Robert Krick says, “The crucial Overland Campaign of May-June 1864 unquestionably pivoted the Civil War in Virginia onto its final course…The leading historian of Vermont’s role in the war paints a vivid picture of that crucial time.” The Battered Stars tells the story of the Vermont units fighting in the 40 day campaign that cost America 80,000 casualties on the bloody fields of Wilderness, Spotsylvania, North Anna, and Cold Harbor. Forward by Edwin Bearss. Senator James Jeffords says, “This fine book will guide travelers to Saratoga, Ticonderoga, Hubbardton Battlefield, Mount Independence, Rokeby, and many more gems set in one of the world’s great historic landscapes.” Guns Over the Champlain Valley is a brief history of, and guide to, the major and little known military sites along the Lake Champlain Corridor, from Saratoga Battlefield to Fort Chambly in Quebec. Forward by Edwin Bearss. Paperback, $20.00 plus $5.00 shipping.